Would you believe me if I told you that, before today’s post, I had two other recipes written, photographed, and ready to share…only to scrap them at the last minute?! I think I was cursed these past couple weeks because I just couldn’t develop a recipe that I could 100% get behind. I have to say it nearly killed me to finish all the work on those new posts only for them to be put on the shelf, never to see the light of day. I hope you know that I only share recipes I’m crazy about (and that my testers are also crazy for) because I want to be absolutely sure you can trust and love them too! So, with my tail tucked between my legs, I moved on from those two recipes…and I’m glad I did! 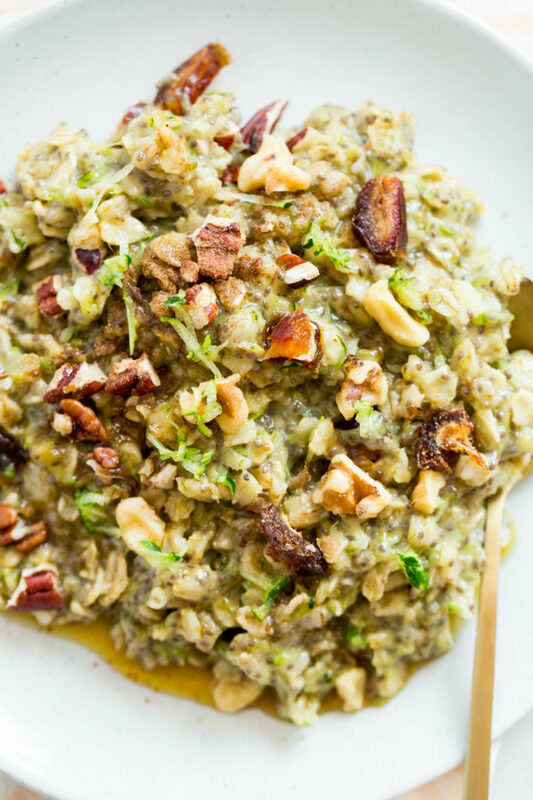 I’m in love with this Zucchini Bread Oatmeal. Some of you may recognize the original recipe from way back in 2011 (how was that 7 years ago!?). Although this oatmeal fell off my radar for a while, it’s made a serious comeback in our morning rotation. This breakfast is a delicious, creative way to fulfill your weekly zucchini quota all summer long! I know it’s a bit early for summer squash season, but I’ve personally been on a huge zucchini kick this month. The recipe will be a good one to tuck away for later in the summer when you have zucchini overload—but I don’t think you’ll be able to wait that long. I decided to revamp my old recipe and give the post a facelift complete with some snazzy new photos for you. 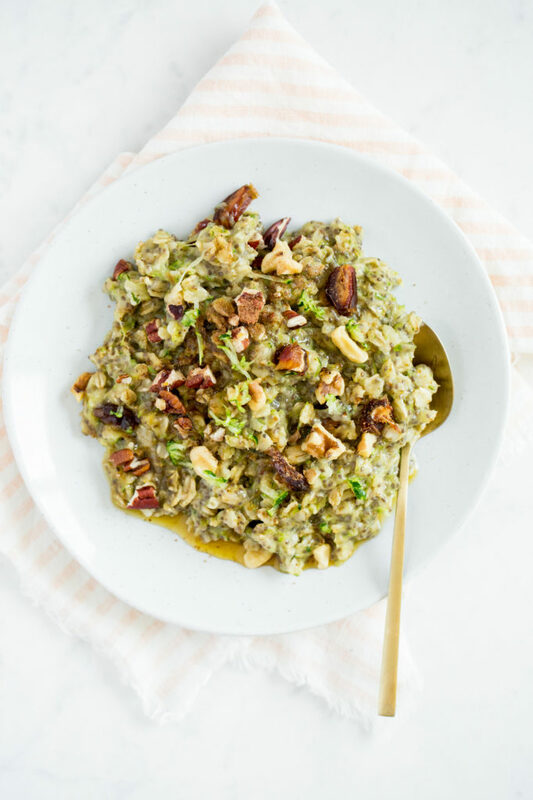 This bowl is one of my favourite ways to sneak veggies into my oatmeal…if you’re crazy like me, you may even find yourself doubling the amount of zucchini for extra morning veggie goodness (just be sure to reduce the liquid accordingly). Sometimes I’ll even use instant oats (gasp! lol) and those work great as well. Leftovers can be enjoyed straight from the fridge, which will be a nice option on those steamy summer mornings too. Before I get to the recipe, I want to thank you so much for taking the time to complete the Oh She Glows Reader Survey! We went through every single response with a fine-tooth comb. One of our big takeaways is that you want even MORE RECIPES!!! *Wipes bead of sweat from forehead*, lol. So in the future you’ll be seeing a bit of a shift in blog content—Ask Angela and Things I’m Loving Lately posts will be less frequent so that I can focus more time on recipe creation. I’m going to try my best to zero in on the content that really matters to you. We also sent out a brand new issue of In The Glow a couple weeks ago (complete with a fun new look too). I had a lot of positive feedback about the “Hello from Angela” message in this issue, so I just wanted to thank those of you who sent me DMs about it. I was also asked by a few readers who didn’t get a chance to sign up in time whether issue 21 would be available online. I’m happy to say that it’s available here! We send out a new In The Glow every 4 to 6 weeks, and if you’d like to receive future issues, you can sign up here. Last but not least, I have to share this with you here because it kind of blew my mind and made my entire week! Does anyone recognize a certain app icon below? 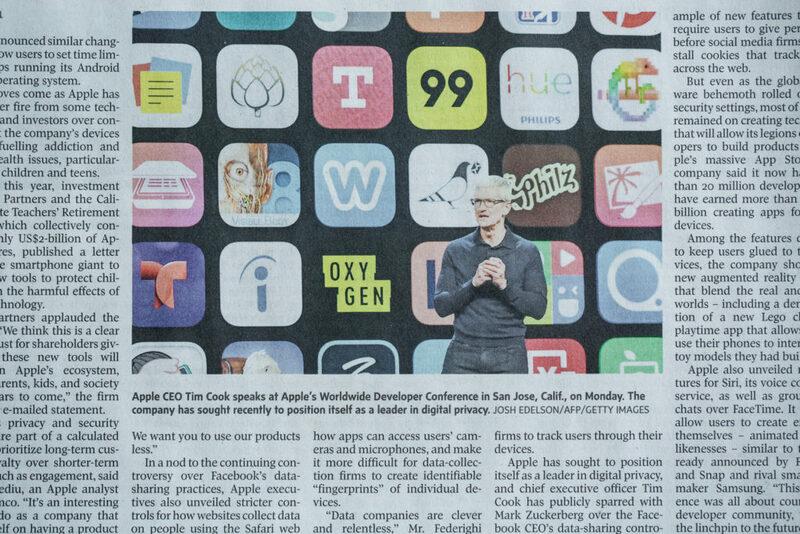 The Oh She Glows Recipe App icon was featured in Apple CEO Tim Cook’s recent presentation at Apple’s Worldwide Developers Conference. You guys, I almost died when Eric plopped this paper in front of me at my desk. His uncle texted him saying we might want to pick up a copy of that day’s Globe and Mail newspaper. (Thanks Uncle Steve for your newspaper sleuthing!) It’s so wild and wouldn’t be possible without your incredible support! 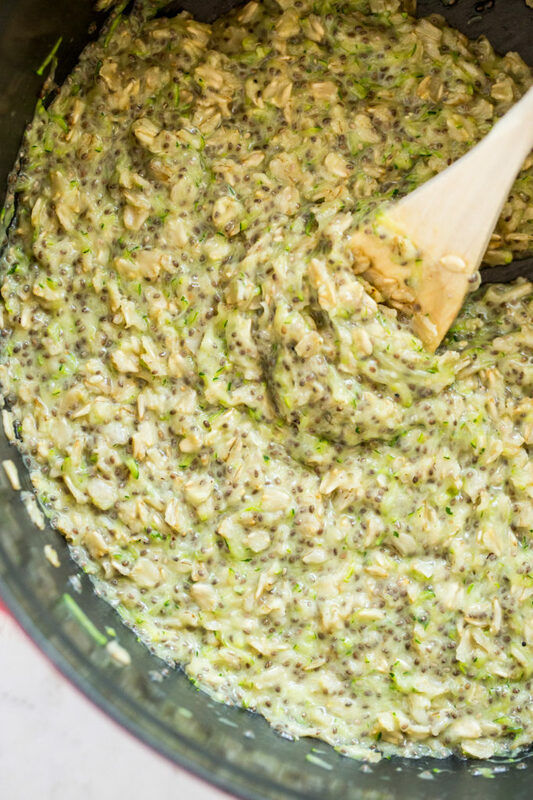 Zucchini bread in oatmeal form...who knew?! This tasty dish comes together in less than 15 minutes—perfect for when you’re craving the warm spiciness of zucchini bread but don’t have time to make a whole loaf. 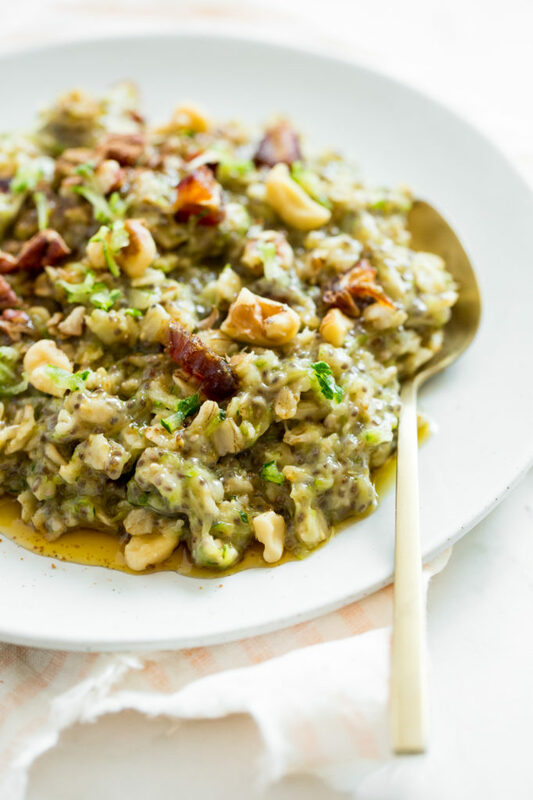 Luxurious canned coconut milk lends this oatmeal a satisfying, decadent creaminess, while the grated zucchini adds a dose of Vitamin C, B Vitamins, and Potassium. Chia seeds help thicken the oatmeal and provide a nice boost of healthy fats! 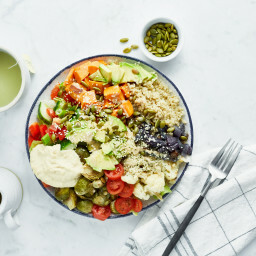 I don’t recommend skipping the suggested toppings below—they give this bowl a nutty, sweet chewiness and that signature zucchini bread flavour. And you may be happy to know that this oatmeal is super versatile (often I don’t even measure when I make it at home! 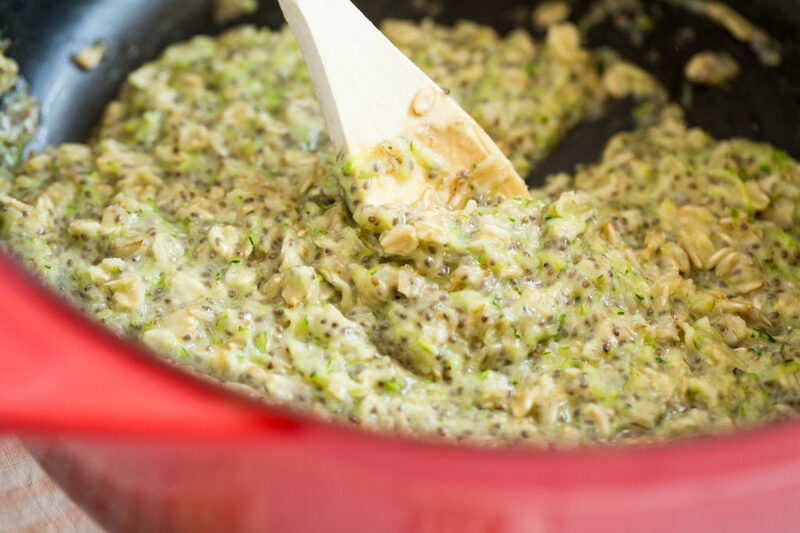 )—you can use rolled or instant oats, grated or finely grated zucchini, and play around with the zucchini-to-oat ratio however you’d like. I encourage you to find your perfect bowl! This recipe is inspired by my 2011 version. Add all of the oatmeal ingredients except for the vanilla to a medium pot and stir to combine. Bring mixture to a simmer over medium-high heat. Reduce heat to medium. Cook uncovered for 7 to 9 minutes, stirring frequently, until thickened. Remove from heat and stir in the vanilla. Adjust spices and sweetener to taste, if desired. Divide the oatmeal into bowls and top with your desired toppings. Leftovers will keep in an airtight container in the fridge for 3 to 5 days. To reheat, add the leftovers to a small pot along with a splash of coconut milk. Stir and heat over medium until heated through. Alternatively, you can enjoy leftovers cold too! Recipe makes 2 large bowls. Nutritional info uses 1 large banana instead of maple syrup. * You can use instant oats instead of rolled oats, if you prefer. Instant oats have a much less chewy texture and tend to disappear into the mixture, but they work well for babies and toddlers who aren’t able to chew the larger oats. 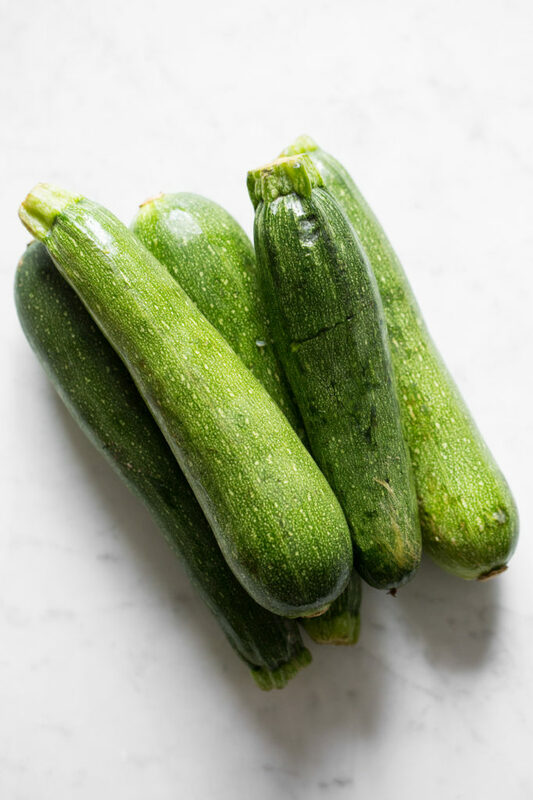 ** If you use the finest grate hole on the box grater, the zucchini will virtually disappear into the oatmeal, whereas a standard-size grate hole will yield visible strands of zucchini throughout (and amp up the bowl’s chewy texture). You can play around with these two options to see which way you prefer the oatmeal. Once you get used to it, feel free to add even more zucchini to future pots! Make it nut-free: Omit the pecan topping. 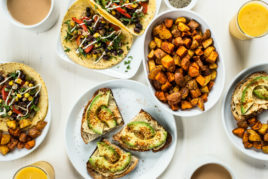 Vegan Mother’s Day Brunch Recipes! Thank you for not settling for less and instead, going for the very best recipes we can make with confidence. That’s a good way of looking at it…thank you!! I will try to remember this when my tail is between my legs and I’m kicking myself over a lost recipe, heh. I really don’t like testing recipes, leaving that work to you experts! I grow tons of zucchini and can’t wait to try this. I would never have considered putting oatmeal and zucchini together, just not on my radar! I’m excited about this recipe, and that you plan to start posting more again! This looks amazing! I’d love to make this and keep it for the week ahead, but I don’t like the taste of leftover banana in the fridge. Do you have any suggestions as to what I could replace it with? Thank you! Hi Katie, I’d suggest using the maple syrup option if possible as it’ll keep in the fridge a bit better. If that’s not possible you could leave both out and serve it with your desired sweetener (or even sliced banana or pitted dates) on top when serving. Oooh looks great! I’ve planted zucchini in my garden for the first time this year, and will definitely be pulling this recipe out when I’m looking for ways to use it up! Fingers crossed we get a great harvest! I hope you do too..super exciting! I miss my veggie garden from our previous house so much. This looks amazing! I love oatmeal and am so happy you suggest subbing banana for maple syrup, because that’s how I like it! Question: would subbing unsweetened almond milk for the canned coconut milk alter the recipe drastically? I’d like to save the calories/fat. Hey Angela – Check your survey link in this post. It looks like you gave readers the option to edit the survey rather than take it. Oops! When I clicked I was able to see the results and everything (so I think I was getting what should have been your private view). Hope you can get that resolved quickly. Good luck! Hey Serena, Thank you…we ended up having to remove it. We didn’t have any share settings turned on at all…so strange! This is an amazing recipe, Angela! Delicious and nutritious – the way I like it. I bet my kids will love it. I printed it so I can make it with them this weekend. Thank you! Absolute perfect! I saw this on my newsfeed this morning and next thing I knew I was eating them! Nutrient packed serious goodness! We already love your carrot cake oatmeal and your carrot cake baked oats and the zucchini twist adds variety to our veggie intake. I actually had to sub half carrot as I didn’t have enough zucchini and it worked just fine, thanks for another great recipe! Hey Carmella, So glad you made this already and enjoyed it! I can’t get enough. I’ve been doubling my zucchini amount (for more volume!) and using the regular-sized grate hold for a bit more chew. I love how versatile it is. Gotta try this recipe for breakfast tomorrow. Thank you for sharing! Angela, is all oatmeal gluten free, or only oatmeal that specifically says that it is? Thank you. 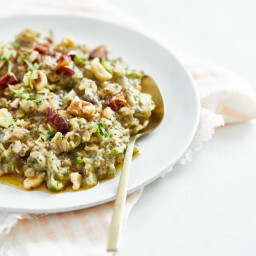 Love your recipes, by the way, and am looking forward to trying the zucchini oatmeal. Hi Lucy, Thanks for the recipe love :) You’ll want to find an oatmeal brand that labels their oats as gluten-free. From what I understand, there’s potential for cross-contamination with wheat in many facilities, so to be sure, use a brand that has a certified GF facility and indicates such on the label. “Only Oats” brand is Canadian and “Bobs Red Mill” is American (but widely available). I hope this helps! Congrats on the app making the headlines ;) That is SO cool! & I can hardly wait to try this recipe! Num! Thanks Tara :) I hope you enjoy it! 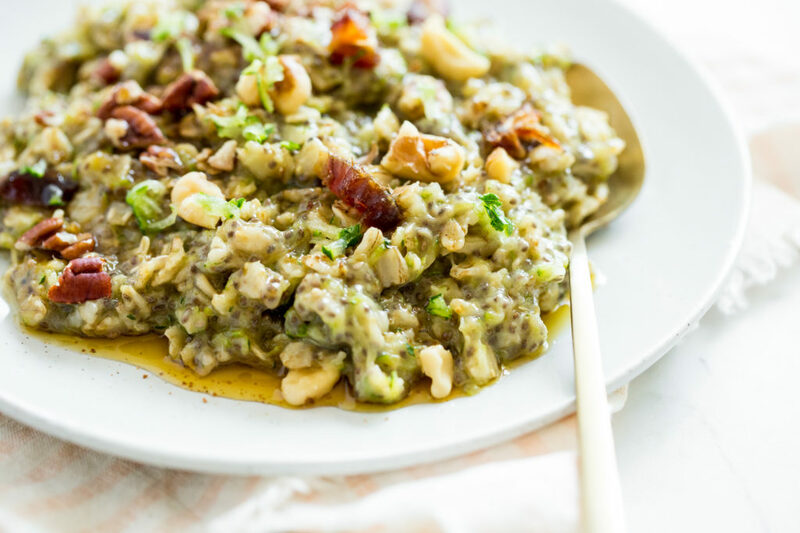 This zucchini bread oatmeal looks AMAZING! I was looking for something new to do with the zucchini I have! haha you’re funny :) Thank you! Well this totally made my Friday! Seriously, thank you for saying such nice things, means the world to me! And yes my face must’ve been priceless when I realized what was in the picture. ;) Ps- when are we going to see each other around town again? I really love that about you…that you make sure a recipe is amazing before you publish it. I don’t try many recipes off of the net because I am often disappointed. But I am never disappointed with your recipes. Keep up the great work! I agree…just grate it all up and stir it in…hah. Thanks Brittany! OMG I can’t wait to make this for breakfast. Now I just need to figure out a way to make it into a baked if possible? I love baking breakfast Oat squares and freezing them. Its so handy and great for busy mornings or even traveling (always an airplane snack for me)! Thanks Jamila! So glad you both liked it. I made a big batch of this last night for the rest of the week and added a little coconut sugar and shredded carrots. So good! My boys (4 years and 2 years) and I loved this recipe!! Thanks for sharing another great one! Hey Megan, So glad it was a hit with your boys! Thanks for letting me know. Just made this and it’s delicious! Came together so quickly too! Zucchini bread and oatmeal are two of my favorites things. I can’t wait to give this a go soon. What a perfect way to start that day! Oh who am I kidding, I’ll end the day with this, too. Breakfast for dinner forever! Oooooh, I can’t wait to try this! I was intrigued when I kept seeing it on your Insta stories, and since I’m always looking for ways to get more veggies in my life, this seems awesome. Yay for zucchini! Thanks..I hope you enjoy it! I’m always like…am I weird for LOVING this so much (jury is still out), heh. We made this for breakfast today. We topped it with a drizzle of coconut mana, raisins, and chopped almonds. My 3 three old and 1.5 year old devoured it. Very yummy! So glad it was a hit with your kids Rachel! Ours love it too. Hi Angela, I made this earlier this week and am enjoying my last serving this morning. I got 3 servings following your recipe. I really, really, really enjoyed this oatmeal. I’m normally an overnight oats girl and enjoyed the cooked oatmeal for a change. I would like to try making this in the crockpot with steel cut oats. Thank you again for posting. Hey Tracy, I’m so happy to hear this!! I’ve been having it every morning without fail. This was delicious!! I used 2 zucchinis, which came out to about 1.5 cups when finely grated. I used toasted pecans, a chopped date, cinnamon, and maple syrup as the toppings per Angela’s suggestion. Yum!! Can’t wait to eat the leftovers! Oh Adrienne that’s such a great question! I haven’t made slow cooker oats in a long time. I think mashed banana would be fine. My main concern is whether the zucchini would fully cook without stirring it to mix it in..might be worth stirring it well half way through cooking and checking on it. :) And you may need more liquid but I’m not sure. I’d love to hear how it goes! I tried this with raw pumpkin and it worked really well and tastes much like pumpkin pie…a little early in the year for a pumpkin crush but I had a huge can to use up. While unrelated to zucchini oatmeal I wanted to tell you about some smoothie experimentation I have been up to recently: I added cooked black and white beans (3/4 cup) to your Classic Green Monster recipe to increase the protein content and it tasted superb! I thought to myself with your palate and your recipe magic you might come up with some other recipes with beans in smoothies…there is one on albertapulse.com for a Pina Colada White Bean Smoothie for inspiration…beans are so inexpensive and a great source of fibre and protein. Thank you for all that you do! I have told countless people about your recipe books and plant-based philosophy and am very grateful for your work. I’ve heard of people adding beans to smoothies and I’ve never been brave enough to try it! hah. I’m so glad it worked for you in the green monster recipe. Who knew?! Thanks for your review on the zucchini bread oatmeal too..so glad it was a hit with pumpkin. This looks amazing! Definitely going to try this, thanks for the effort and the post! Just made this today, yum! Thanks for the recipe! I followed it exactly (with banana) and it was perfect. This recipe seems good with oatmeal. Gotta try these 8 min cooking time recipe. Looks amazing! Anyone tried freezing this? Interested in making large batches for quick breakfasts! Hi Steve, I haven’t tried it yet but I’d love to hear how it goes if you do! Hope you enjoy…such a perfect time of year to use up some zucchini! I love adding double the quantity in mine for an added veggie boost. I made this today with the banana option, and my just turned 1 year old and 2.5 ate it! I had to refer to the zucchini as ‘green wonder’ when pressed, but it was so good. I made this today for breakfast and it was SO delicious!!! It was very easy to make and I will be making this a lot! What a delicious savory option for breakfast! Thanks for sharing this with us! Thanks Pat :) I hope you enjoy it if you try it out! This is delicious! I made today for myself and my 2 year old and we both loved it. I grated the zucchini finely and topped with pecans and raisins. Thanks for the new go-to recipe! Aww thanks Annie, so glad to hear that you and your 2 year old loved it. :) Whohoo for zucchini season! Thanks for posting a creative way to use up zucchini. My garden is pumping them out right now and I’m getting pretty sick of grilled squash! Hey Leanna, thank you so much for your awesome feedback! I love the idea of throwing some buckwheat groats in there. Delicious! It was like eating banana bread out of a bowl, except healthy and totally satisfying. I used yellow zuchinnis from the garden and almonds and dates as a topping. Will make again 100%. I love that analogy…banana bread from a bowl…yum!! This is yummy and a great way to have veggies for breakfast! My kids all loved it (ages 1, 4 & 6). Have you tried it in the instant pot? I do a lot of prep at night, set to go off in the AM oatmeal in there but wondering how the zucchini might be after an all night soak. Thanks! Hi Katie, So glad this recipe is such a big hit! It is in our house too. I just got an Instant Pot last week and I’ve only tried steel cut oats so far (I liked a ratio of 1 cup steel cut and 2 cups liquid cooked at 6 mins high pressure with natural release – but I’ve only tried it a couple times so far!). I have yet to try rolled oats in the Instant Pot…I wasn’t sure if it would be worth it since rolled oats cook so quickly on the stovetop. If you try anything out I’d love to hear how it goes! Hi! This recipe looks like a dream! A couple of questions. I’d like to do steel cut oats in the crock pot. Any idea the liquid/zucchini ratio for a cup of oats? And can I use water instead of coconut milk? Thanks so much! 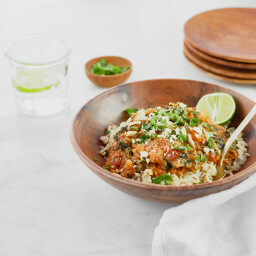 Hi Adrienne, FUnny timing — I’ve been working on a SC oats recipe for the Instant Pot recently! I love 1 cup uncooked steel-cut oats, 1 cup water, and 1 can of light coconut milk cooked at 6 mins high pressure with a natural release. So good! I hope you love it if you try it. And if you don’t want to use the coconut milk, I would swap it with water, but I’m not sure if you’d have to reduce the amount slightly since it’s not as thick. I just resurrected this recipe today. It is ready and in the fridge for tomorrow morning. We love this recipe! Ohhh this one has been on my mind lately too!! Can I use low-fat Milk instead of coconut milk? This so easy and so delicious. Kind of makes a person glad it’s the new year and I am trying to “clean up” my food choices!! So glad you love it Robin! I just remembered it the other day and I have plans to make it asap! It’s so creamy and comforting…mmm. I loved this recipe — it’s different from a normal breakfast, for sure and I get an extra veggie in my diet. It tasted heavenly. I did alter slightly by only using 1T of brown sugar. I added walnuts as suggested but added blueberries instead of a banana and no maple syrup. It was perfectly sweet with just the one tablespoon of brown sugar, for me. Thank you for another great recipe! Hi! I notice in your post that you say that you can double zucchini but will need to adjust liquid accordingly. I am not an experienced cook. How much liquid do you need if you double the zucchini? Thanks! 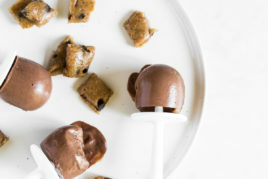 Previous post: Ask Angela: OSG recipes with 5 to 7 ingredients, my favourite popsicle molds, freezer-friendly summer recipes, and more!